Bio-Cut - MR Clear : Semi automatic,disposable, guillotine type soft tissue biopsy needle for MRI use. Auto-Shot : Semi-automatic Gun for use with Bio-Cut. Spring-Cut - MR Clear : Semi automatic, disposable, guillotine type soft tissue biopsy needle instrument for MRI use. Colt - MR Clear : Automatic, disposable, guillotine type soft tissue biopsy needle instrument for MRI use. Due to the introduction of open and semi-open machines, Magnetic Resonance Imaging (MRI) is no longer a tool that is just used by a few specialists in diagnostic imaging. Open MRI units were originally designed to reduce patients’ claustrophobia. Physicians discovered quickly that many interventional procedures are much easier to perform under these open MRI systems than under conventional Computer Tomography (CT). The new open magnets have stimulated this progress significantly, although interventions are currently also frequently performed in conventional MRI units. Today, images can be built up as fast in MRI as in CT due to its improved software. Biopsies of breast and liver tumours were among the first procedures to be part of Interventional MRI in Oncology. The key for a well functioning procedure under MRI is the material of the instruments that are used. Instruments have to be non-magnetic, with a low artefact, in order to be seen and handled properly. 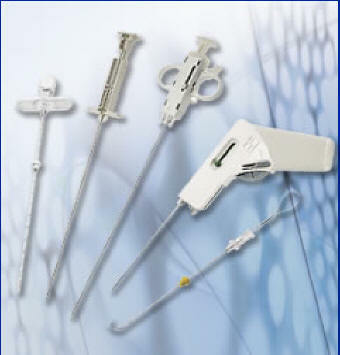 These biopsy and needle products are produced by one of the few companies in the world to develop such materials and to provide properly visible instruments for Interventional MRI procedures. MR-CLEAR® is the range of soft-tissues biopsy needles for the interventional MRI procedures: from the Chiba-type needle (Complete-Chiba®) to the manual or automatic guillotine biopsy needle (Bio-Cut® / Spring-Cut® / Colt®). MULTI-CORE® is the latest single use biopsy device, which performs the entire biopsy manoeuvre quickly, fully automatic, with precision. 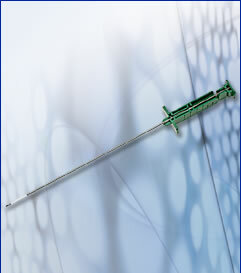 Versatile, simple to use and reliable, with unique ergonomics for cocking and firing, it represents the “state of the art” among automatic biopsy instruments, to date. Spring loaded stylet and cannula harvest diagnostic quality specimens with minimal tissue displacement or needle deflection. MULTI-CORE® can be easily operated with one hand, making it ideal for procedures requiring ultrasound guidance. The needle, made from the echo reflecting metal alloy ECHONOX®, is entirely visible for its whole length under ultrasound guidance and the procedure is free from any risk for malignant cells seeding. MULTI-CORE® is also available with the exclusive TOP-CORE® notch geometry feature, which delivers tissue cores up to 50% larger than standard competitive needles). MULTI-CORE® is also available as specific set for CT scanning as well as with detachable cannula for single-access procedures. For Antenatal Diagnostics, Cytologic Biopsy and Medicine or Anaesthesia injection before prostate biopsy. Minimum order : 4 packs of 5 pcs. 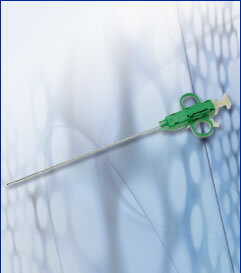 Semi automatic, disposable needle device with handle for tru-cut biopsy. Takes a 20mm core length. Available with a semiautomatic biopsy gun : Auto-Shot ( see below ). Minimum order : 4 packs of 5 pcs. Semi automatic, disposable, guillotine type soft tissue biopsy needle instrument with handle for tru-cut biopsy. Takes a selectable 5mm, 10mm or 20mm core length. 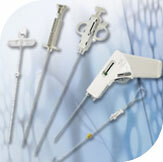 SPRING-CUT®DC represents the latest generation of semi-automatic guillotine-type biopsy needles. 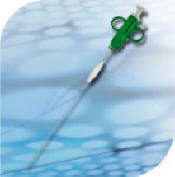 Its exclusive features single it among all other biopsy devices in the same category. Stylet advance button remains locked during penetration: simpler manoeuvre, increased safety during the biopsy procedure, enhanced sensitivity upon penetration. Pre-selectable bioptic throw (5-10-20 mm), adaptable lesion sampling size. Stylet completely retractable from the cannula left in situ: control of the adequacy of the specimen, ideal for multiple biopsies (prostate mapping). Stronger mechanism: reliable cutting of the most compact tissue. Specific product releases for CT-guided procedures (TC) and endo-urologic use (DC) available. Fully automatic guillotine type soft tissue biopsy needle gun for tru-cut biopsy. Takes a 20mm core length. Minimum order : 4 packs of 5 pcs. Fully automatic guillotine type soft tissue biopsy needle gun for tru-cut biopsy. Takes a 20mm core length. Set with removable ( Temno Coaxial ) cannula. Minimum order : 4 packs of 5 pcs. COLT® is a single use, guillotine-type, soft tissue biopsy instrument which performs the entire bioptic manoeuvre quickly, fully automatically with precision. 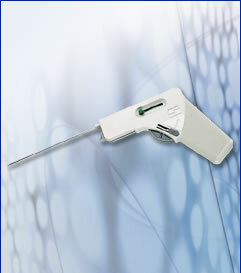 Versatile, simple to use and reliable, with the unique rapid firing or two-stage firing feature, it represents the state of the art in automatic biopsy instruments. COLT® can be easily operated with one hand, making it ideal for procedures requiring ultrasound guidance. Sample biopsy core length 20mm. Stylet completely retractable from the cannula left in situ: ideal for multiple biopsies (prostate mapping). Specific product releases for CT-guided procedures (TC) and for endo-urologic use (DC) available. Colour coded for easier needle size (gauge) determination.